Can a Felon Get a Private Investigator License? There are resources available for felons searching for work although they may not believe anyone will hire them. Those who have hired felons, however, have learned that they make good employees. Those with an interest in detective work may want to look into becoming a private investigator. 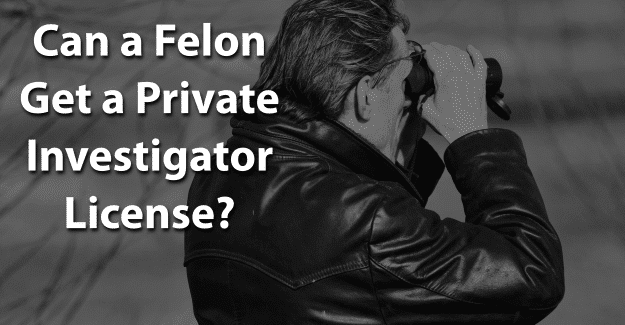 This blog post will address the issue of whether or not a felon can get a private investigator license. What is a Professional License? What is a Private Investigator License? How Much Does a Private Investigator Earn? An investigator also conducts surveillance when investigating a case. He or she may watch a location, such as a person’s home or office, and may collect information on a person of interest. A detective is required to have a good understanding of federal, state, and local laws, such as privacy laws, and other legal issues affecting his or her work because private investigators do not have police authority. A private investigator’s work is done with the same authority as a private citizen. A license is issued by a state agency to practice a profession and is required to call oneself a licensed professional. Some states have a single license and some have a level system, and licenses, as well as requirements, vary from state to state, depending on the profession. Licensing is a type of mandatory certification. Under a licensure system, states define the practice of a profession and stipulate that the position may be legally performed only by those who are licensed. A certification is typically a voluntary process, although certification can be mandatory or required to be a private investigator in certain states. Certification is often provided by a private organization for the purpose of providing protection for those who have successfully met all requirements for the credential and demonstrated their ability to perform their profession competently. Most states require a private investigator to have a license. A candidate should verify the licensing laws related to private investigators with the state in which they want to work. The remaining 45 states (plus the District of Columbia) do license a private investigator, and therefore have specific licensing requirements, which include education and experience requirements and application procedures. A number of states allow private investigators to carry weapons, so mandatory firearms training and certification are common. However, because each state has its own legislation regarding the practice of private investigators, licensure requirements and the licensing process vary from state to state. Education and experience for licensing requirements differ among states. Typical education requirements include an associate’s degree or higher in criminal justice or a related field, while experience requirements vary based on certain factors, including the field in which the experience was obtained. Many states allow candidates to substitute education for experience to meet minimum guidelines for licensure. A candidate may also obtain certification through a professional organization, although it is not required for employment. This would demonstrate competence and may help a candidate in career advancement. For an investigator who specializes in negligence or criminal defense investigation, the National Association of Legal Investigators offers the Certified Legal Investigator certification. For other investigators, ASIS International offers the Professional Certified Investigator certification. According to the U.S. Bureau of Labor Statistics there were about 41,400 private investigators in 2016. The median annual wage for private detectives and investigators was $48,190 in May 2016. The amount an investigator earns depends on experience and skill level. Employment of private investigators is projected to grow by 10 percent from 2016 to 2026, faster than the average for all occupations. Increased demand for private investigators will come from security concerns and the need to protect confidential information. Most states have strict statutes prohibiting candidates with felony convictions or misdemeanor convictions involving crimes of moral turpitude from obtaining a private investigator license. A crime of moral turpitude is one that violates the ethical standards of a community and involves betrayal of public trust. Another challenge will be in finding a position as a private investigator. It is important to be honest when applying for a job in this field. If a felony isn’t disclosed but is found on a background check, this constitutes as fraud and is punishable by jail time. It is a crime to falsify an application, which could result in being sent back to prison. To be successful in obtaining a private investigator license, it’s essential for felons to be honest about their background. They are already seen as being dishonest, untrustworthy, and unwilling or unable to follow directions from authority figures. Having their record expunged can give them the chance needed to begin with a clean record and succeed in becoming an investigator. Expunging a criminal record allows anyone to honestly state on an application that he or she has not been convicted of a crime. It’s a major challenge, but it might be worth it for a felon wanting to get a private investigator license. Giving him or herself the best chance for success by having his or her record expunged and also documenting additional education could make the essential difference. Having support from family, friends, or previous employers can make a huge difference. A felon doesn’t have to be defined by his or her crime. We are not defined by our mistakes but by how we recover from them. He or she can begin again and live an honest life and achieve his or her goal no matter how difficult it might seem. What do you think about this blog post? Have you or someone you know been in the situation of trying to get a private investigator license with a felony? What was that like for him or her, and how did he or she achieve success? Please tell us in the comments below.